IMAX launches laser projection system in UK – and it looks spectacular | What Hi-Fi? Six months after introducing its new laser projection system at the TCL Chinese Theatre in Los Angeles, IMAX has launched the state-of-the-art technology in the UK. London’s Empire, Leicester Square is the first cinema in Europe to feature the technology. Every year, there’s a handful of films where that huge IMAX curved screen really comes into its own. And now that ultimate cinema-going experience is getting a boost, thanks to IMAX’s new laser projection system, which promises to redefine the cinema with better than ever pictures and sound. The system uses two 4K laser projectors, running simultaneously with sub-pixel alignment to deliver a ‘perceived’ greater-than-4K resolution. Delivering images up to 1.43:1 aspect ratio – considerably taller than the standard cinema projection – it’s only compatible with IMAX screens over 75-feet wide. Empire’s wall-to-wall, floor-to-ceiling screen (pictured below) is 87ft, while the biggest kitted-out so far is in Sydney at 120ft-wide. Designed from scratch, the laser projectors take a different approach from typical - and IMAX’s standard Xenon - cinema projectors, in an effort to increase sharpness and prevent whites washing into blacks. This occurs in projectors as the mirror chips on the prism inside are constantly heating and cooling to produce bright and dark images, expanding and contracting in turn, pushing them and thus the pixels slightly out of alignment. In short, the IMAX projector does away with the prism and replaces it with a patented ‘box’ made from a thermally stable metal called Invar designed to limit any movement from components changing in temperature. That, and a bunch of processing and remastering, is how IMAX says its new system redefines sharpness, detail and colour expression on the big screen, while delivering contrast “more than twice what film’s ever was”, according to IMAX’s chief quality officer and exec vice president, David Keighley. The bar has also been raised with audio. The new system gets a 12-channel surround sound system – double that of the existing IMAX system – by adding four ceiling and two side speakers to the standard rears and fronts. To ensure the sound is always correctly tuned and the picture is properly calibrated, each IMAX cinema with this system has microphones and a camera to perform a series of checks before each screening. IMAX promises this is the "best way to see films", and from our first impressions we find it hard to argue. We saw the system in full-swing and it’s a real audio visual treat. A serious leap from its existing system? We’d say so. Colours look more solid, more detailed and that bit more eye-poppingly bright than we’re used to from the IMAX experience. The new system claims to crank up brightness levels – a benefit part and parcel of using a laser light source instead of a bulb – which is particularly helpful for darker 3D pictures. The gigantic screen itself has a wow factor that’ll have you gripping the arm of your chair for reality checks for the first few minutes. But it’s contrast that’s the real game-changer here, especially when it comes to black levels. You really get the impression of lights-off blacks – none of this dark-grey business that you might be lumbered with at your local multiplex. Part of IMAX’s demo projected a full-screen checkerboard to show the rigidity of black and white edges, and in the real thing – the brand-new Spectre trailer – the pixel’s making up Bond’s black jacket and white shirt look poles apart when it comes to contrast. During the Star Wars: The Force Awakens trailer (we really were spoilt), the title’s bold white and black text looked impressively striking, as did Kylo Ren's black cloak and red lightsaber. Although picture quality is the bigger talking point here, the audio experience is no less impressive. The extra speakers provide an enveloping, notably expansive soundfield that offers immense height and scale, ensuring launching rockets go right through your body and you can almost feel crashing waves lapping against your toes. Almost. It’s an exciting time for cinema. This IMAX news follows hot-on-the-heels of a similar system from Dolby, Dolby Cinema, which also uses a laser-projector-based system complete with HDR support and promising "incredible blacks and a contrast ratio that far exceeds any other image technology on the market today". And of course, there’s Dolby Atmos in its armour. We’d love to see how it matches up to the new IMAX experience, but for now the Dolby Cinema count in the UK is... zero. 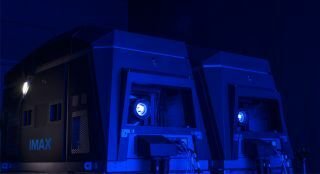 The IMAX laser projection system launches at the Empire, Leicester Square today (2nd October) with The Walk in IMAX 3D. Spectre (Oct 26th), Star Wars: The Force Awakens (Dec 17th) and Crimson Peak (Oct 16th) are all lined-up to be shown in the new cinema. IMAX says it has signed 70 of its cinemas worldwide to the laser projection system, but for now it looks like Empire, Leicester Square will be flying solo in the UK - and we urge you to pay a visit. Even if it does cost nearly £20-a-pop.